In 2012, the City of Cape Town commissioned professional consultants to undertake the Atlantis Business Retention and Expansion (BRE) study. This study looked at economic trends in Atlantis to identify the key opportunity drivers of change within the Atlantis economy, as well as examining specific interventions that could be adopted. What the study found were signs of decline and job loss in certain sectors in the manufacturing industry. However, it also revealed evidence of vigorous economic activity, resilience and significant growth potential. The BRE study described that the manufacturing sector was stagnating in comparison to the finance and service industries. A recommendation for urgent intervention was adopted by the City of Cape Town and as a result of these efforts, Atlantis has seen a marked increase in new industrial investment. The total value of this investment thus far is estimated at over R500 million, with the creation of about 500 new jobs. The City of Cape Town further demonstrated their commitment to Atlantis by announcing an investment incentive scheme early in 2013. For the purpose of our plan, we examined ED on three levels: local, provincial and national level. Along with National Government’s economic policy incentives, the Western Cape Provincial government has highlighted the goal of developing the West Coast as a Green Economy Hub. In January 2011, the Western Cape Government’s Department of Economic Development and Tourism (DEDT), through the Green Cape Initiative, started developing plans to establish a clean technology manufacturing hub in Atlantis. Growing the green technology sector in the Western Cape. Promoting the revitalisation of Atlantis as a key industrial node in the region. Attracting domestic and foreign direct investment into the area. The South African National Government has identified industrial development as the key to developing a successful and prosperous nation. To this end the Department of Trade & Industry (DTI) is following an industrial development strategy that, among other levers, uses Special Economic Zones (SEZ’s) to encourage industrial development. Based on this mandate, the DTI’s feasibility study on Atlantis shows that it is a feasible area for the establishment of a special economic zone. An application is currently in process and the designation of Atlantis as a SEZ is imminent. Other key development areas that we are cognisant of is that of Social and Environmental Development. It is our fundamental belief that society and the environment must grow in parallel with economic development. 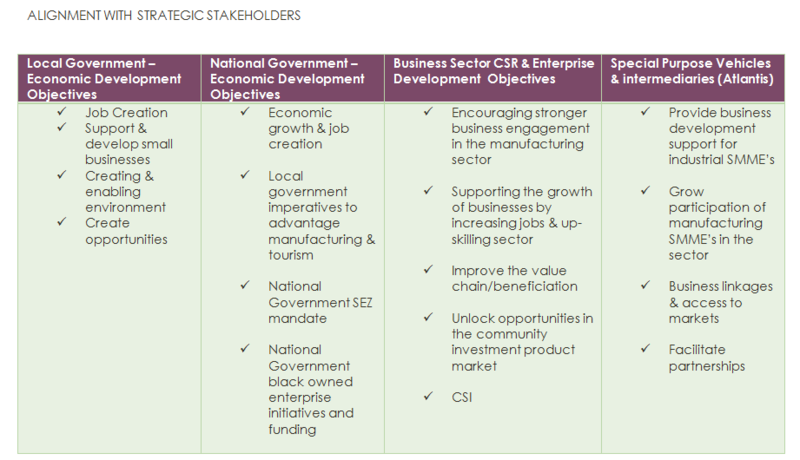 Our economic development analyses reveals many challenges in the ecosystem, but it also presents us with an equal amount of opportunities to align with local, provincial and national initiatives. An inclusive approach will help us gain long term support. Qei Holdings is registered in accordance with Section 14 of the Companies Act of 2008. The Health & Safety (H&S) aspects of the factory incubator will be managed by a designated volunteer officer who will receive all the necessary training to ensure that a safe operating environment is provided. All compliance regulation is overseen by the shareholders.